Have you ever thought about how easy it is to ruin a movie? It doesn’t take more than a handful of clumsily used stereotypes to turn an interesting, nuanced and engaging story into a pile of crap. Cheesiness and clichés are always luring in the shadows. It takes a lot of integrity from a screenwriter or director to spot it and find an alternative route. It doesn’t turn the characters into cartoons. The pirates could have been thoroughly evil with no reason given whatsoever for their actions. Evil for the sake of being evil, as villains are in oh, so many movies. The captain could have been a handsome, invincible, flawless hero, instead of the normal human being he is. It sounds like a small thing to ask for – real human beings – but it’s actually pretty rare in non-art house/indie movies. It doesn’t split focus into a redundant parallel story about the suffering family. How easy wouldn’t it have been to make half of the movie be about the poor wife worrying at home? In almost any other movie they would have done this. But not here. The filmmakers assume that we can figure out that she’s troubled by the events. And they’re perfectly right. It doesn’t make the pirates speak English with each other. I just hate it when they don’t trust English speaking audiences with subtitle reading, such as in the case of Warhorse, where the French and Germans all speak English. Not this time though. The pirates from Somalia speak their native language with each other, which contributes the absolutely natural, documentary feeling. It doesn’t waste time on an extensive background. It’s easy to assume that the audience needs a lot of background about the characters in order to care about them. Actually we don’t. It depends on the situation. I would have cared about Sandra Bullock’s character in Gravity, regardless of what had happened to her back at Earth. And I don’t need to learn about Captain Phillips’ childhood or hear his grandmother cracking words of wisdom to root for him. As of the pirates, we get a glimpse of the life they’re leading in the village, before they decide to hijack a ship. A couple of minutes is all you need to, if not approve, at least understand what makes them act as they do. Paul Greengrass has a minimalistic approach. He trusts the material to be engaging and he trusts the audience to be smart enough to draw conclusions of their own. Rather than wasting time on background, he uses it to pull the viewer even deeper into the movie. He can afford to let the movie slow down for a while as the kidnapping drama progresses. For a moment it moves so little that you lose track of time and space. It feels as if you’ve spent an eternity on that little boat with Captain Phillips and the pirates and you’re running out of oxygen, feeling nauseated, claustrophobic and quite seasick. Which I think is exactly what the filmmakers intended. It doesn’t overdo the end. Without getting into details, the ending is the strongest I’ve seen in movie for a very long time, a scene that from now on will be top on mind when I think of Tom Hanks (alongside with a certain box of chocolate and a drooling dog). It’s almost shocking how good a scene like this can be, depending on the performance. But even if the end is strong, it’s not by any means cheesy. No parades, no flags, no handshaking with the president (thanks god for that). It’s like when a diver makes a perfect entry into the water at the Olympics final. No splash, no hesitation, no overdoing of the whole thing. It’s plain, it’s perfect and it leaves you absolutely exhausted, but somehow in a good way. I know that some people have had some issues with Captain Phillips. There have been complaints about how the true story about the real hijacking that took place a few years ago has been altered. If you ask me, I don’t give a crap. I don’t know how you feel, but speaking for myself I’m sick and tired of how issues like this are brought up for every single movie that has any connection whatsoever to reality. People need to learn to accept that fiction is fiction and “based on” is not the same as exact re-enactment! Give us a break, please! And if you’re a filmmaker and take your inspiration from real life events, perhaps you should reconsider how you market your movie. Do you really need to stress the reality element in it? Why not let people find out the similarities by themselves? And once they find them, just smile and shrug and say that it must be a coincidence. White lies are acceptable, as long as they save us from yet another annoying, boring discussion about how real a reality based movie needs to be. 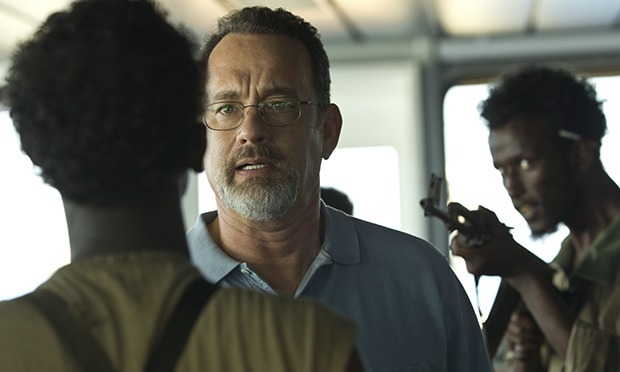 As uncomfortable as it was to watch, I thought Captain Phillips was excellent and it will be a strong contender when it’s time to make the top 10 list of 2013. Great post. I think the screenplay is the unsung highlight of this movie. Especially with regards to point #4. The film had this awesome way of tossing in brief anecdotes about the characters and their backgrounds without making it into a “movie monologue” and unrealistic exposition. It pulls it off with this effortless casual flare too. It gave me more than enough depth and I really admired that. Thank you! I never used the word “writing”, but now that you mention it I think it’s got a big role in making this film so good. It’s using time and space so wisely, sparsely and seemingly effortless. I really love the documentary feeling in it. Great post. This has made me even more excited to see this film. I saw the trailer yesterday before Thor and I was so tense! Haven’t seen the movie yet, obviously, but I’m glad it doesn’t fdo the 5 things you list. Thank you! I’m recommending this film to everyone I can. It’s one of the top movies of this year so you’ve got something to look forward to. Prepare yourself for a lot of tension. I was exhausted after watching it. Nicely delivered Jessica. I must admit that the “based on a true story” tag does affect me a little. Although I will overlook it if the film still manages to be plausible and engaging enough. Thank you! My advice is to try to shrug off that tag, treating films that wear it like any other scripted feature film. It shouldn’t mean that much. Captain Phillips is up there as one of my favourites from this year. For all the points you so eloquently mentioned. Really well written, Jessica! It’s such a shame when strang reactions from the audiences ruins great, sensitive moments in the movie. But I’m glad you could enjoy it overall nevertheless. Thank you so much for your very kind words and support!